This is post #1 in an ongoing series of articles about my work as a poker bot developer. 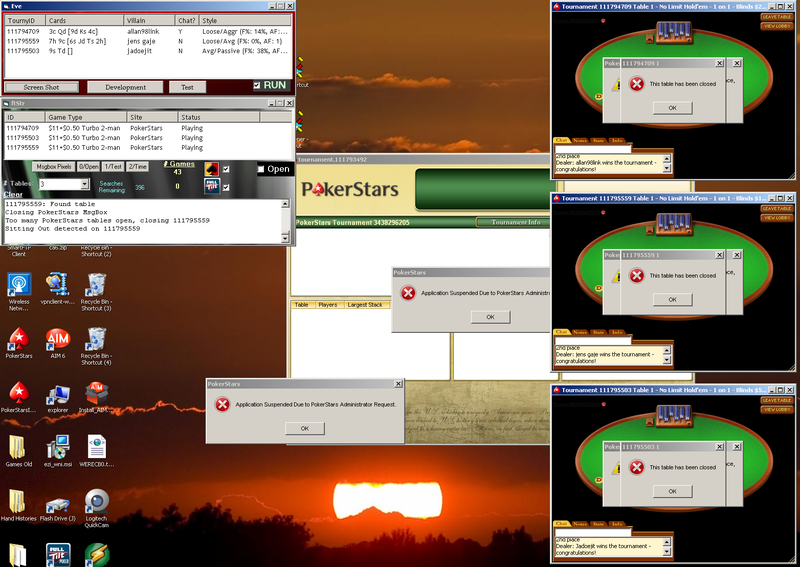 October 2, 2008 was the last day I played online poker… well sort of. I actually hadn’t played for many months prior to that, though that’s probably not what you’d have concluded if you looked at the activity on my account. The hand histories would have painted a different story–one of an extremely active, fairly profitable player at PokerStars’s Heads Up No Limit Hold’em Sit-n-Go’s, which are basically short one on one poker tournaments. The thing is I didn’t play any of those games — a poker bot I built called EVe did. October 2 was the day PokerStars figured it out. I’ve debated for a long time whether to write about it. On one hand, the online poker community usually doesn’t react well to this type of thing (go figure). Bot discussions tend to get a lot of “People like you destroy the games”, “What a scumbag you are…I hope you get banned” and “I hope you die in a grease fire”-type responses and I definitely don’t want to die in a grease fire. On the other hand, I learned in the process and I’d like to share some of my experiences. I have nearly two years of stories, spreadsheets, hand histories, and results that I think a lot of people will find fascinating. Maybe, just maybe, talking about it will result in better bot detection techniques, which the poker sites very much need. I’d also like to try to convince any ambitious programmers out there that they’re better off eating glass than trying to create a poker bot (because at least with the glass you’ll quickly feel the pain and realize what a terrible idea it was, unlike building a poker bot). After weighing the options I’ve decided to go ahead and write about it a little bit at a time. If the feedback is positive, I’ll keep writing and if not, I’ll probably stop. We’ll see how it goes. Posted on June 12, 2009 by Mazur. This entry was posted in Poker Bot. Bookmark the permalink. I hope you’ll continue. I’m going to mention this on Coding The Wheel and you can expect some company real soon. Thanks — appreciate the support. Hi, and thank you for sharing your (bad) experience ! What do you think was the weak point of your bot for PokerStars to figure it out ? Maybe it bet too quickly, or always after 5 seconds, maybe there were not enough random actions ? hi, I’m interested to read your story. there are certainly plenty of people writing bots now. I’ve given up playing online from what I know and just stick to live games. A little more fun and entertaining. Certainly I believe that this will be the end of online poker. I personally don’t object to bots, building one is certainly an interesting challenge and hats off to those who succeed. there’s quite a large complex amount of computer science technology required to build bots. I believe I played too many games and it raised a flag somewhere which ultimately led to my suspension, though I have no proof of it. I plan to write about my experiences extensively in the coming weeks.